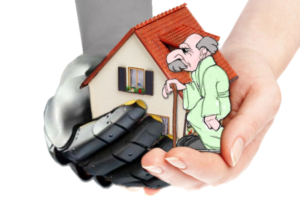 MoveCare integrates an existing robotic platform with a domotic system, smart objects, a virtual community and an activity center, to provide, through artificial intelligence, assistance, activities and transparent monitoring to the elder at home. MoveCare can be tailored to each elder thanks to a modular design. It is completely unobtrusive as MoveCare does not require the elder to wear any particular device.